The kids will absolutely love it at Le Chevrefeuille, there are so many things to do and see in and around the local area it would be too much to mention them all. We have put together a very small list of childrens’ activities that will put a smile on every kid’s face ( and the adults will love them as well ). Every Thursday, Le Chevrefeuille offers a unique experience of cooking with fresh local ingredients with resident chef, Ian. 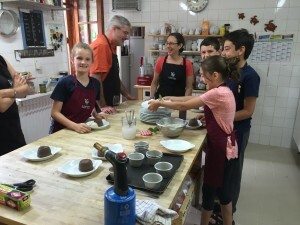 The half day experience starts at 10am in the kitchen where the kids and parents prepare a two course lunch menu under Ian’s experienced guidance. Children under 12 need to be accompanied by at least one adult, children over 12 can be left to experience this yummy experience independently. The not to be missed medieval museum hosts a large collection of arms and armour. Films and interactive learning devices show the evolution of fortifications and war techniques. 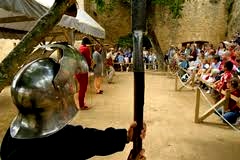 In the grounds there are real size reconstructed, medieval war machines. During the summer there is additional entertainment such as fencing demonstrations (children aged seven years upwards can take part), guided visits led by two actors and story-telling for children. A Village that recreates local life in the last century. 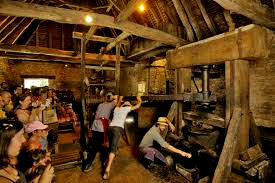 It has a real working windmill and there are demonstrations of lost crafts such as pottery, bread and lace-making. You can even get dressed up in clothes from the 1900s and have your photograph taken. Programmed workshops and live entertainment during the summer. There is both a restaurant and picnic area. 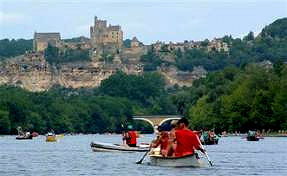 There are numerous points along the rivers in the Dordogne where you can rent a canoe. Life jackets are provided and water-tight containers for valuables can be rented. Canoes can take up to four people. A fantastic day out for all the family as you can stop along the way at the riverside beaches, and have fantastic views of the old villages and castles along the way. Don’t worry about falling in, the river level is normally very low in the summer and you can usually stand up in the water. Over 6,000 different types of fish in 30 different pools. New this year is the anaconda. There is also a reptile house with snake pit and an iguana park. The beautifully sculptured boxwood bushes are a result of the work of generations of the same family. For the children there are woodturning demonstrations, play areas, a maze and workshops (masks, picture frames etc). Every morning during July and August (except Saturdays) there is an introduction to rock climbing for children ages 6 years and over. Candlelit evenings are held every Thursday during the summer. There is both a restaurant and picnic area. Fifty metres underground this “crystal cathedral” is immense. 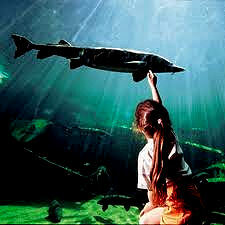 Visits are by guided tour which takes about 45 minutes have a light and sound show. Outside there is a geological area, forest pathway, bar, shop and picnic area. This is an impressive cave with plenty of ducking and manoeuvring around stalactites and stalagmites. 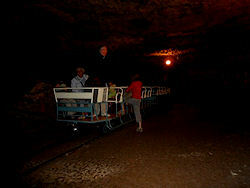 The Cave of Rouffignac is a very large prehistoric cave that can be visited on board an electric train. The cave features 250 paintings and engravings representing mammoths, horses, bison and rhinoceros. The cave of Rouffignac is unique in many ways. First, it is about three miles from the Vèzére River; all the others are much closer. Secondly it is really long -(several miles!). 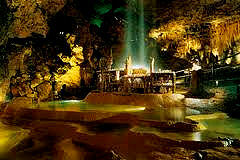 In order to see the artwork you join your guide on a small electric train that travels about half a mile into the cave. This is a real selling point to the kids! Finally, it has been the frequent winter dwelling place of hibernating bears for millennia. All along the way inside you can see their burrows dug into the soft sides of the cave and the scratching of their claws as they trimmed their nails upon waking each spring. 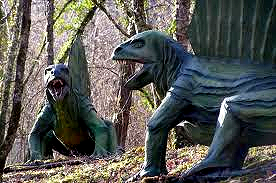 Le Conquil, Périgord’s “Jurassic Park”, is a family attraction with a troglodytic site, walks in the dinosaur park, and its adventure course. Le Conquil is opened from April to the All Saints’ Day (1st November). 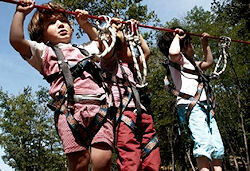 Close to Montignac the 18 ha Park has a wide range of dinosaurs to suit all junior explorers who will also enjoy the aerial walkways and adventure equipment including a 140m ropeway! 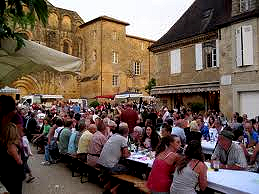 Night markets are held in the evenings in summer months only, and focus on eating outside in convivial surroundings. You choose your food from the market stalls that surround a central square, which is set up with tables, sometimes with music and dance, etc. The produce sold comes from local farmers and producers, and is typical of the region. These markets have a great family atmosphere and you can find a different one happening locally each night of the week. La Foret des Ecureuils (Forest of the Squirrels) adventure park between Souillac and Sarlat is great for squirrels of all ages with treetop trails, paint-ball, children’s games, forest walks, mountain-boarding, snack bar and picnic area. 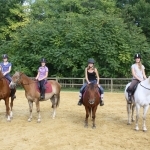 A good adventurous day out!